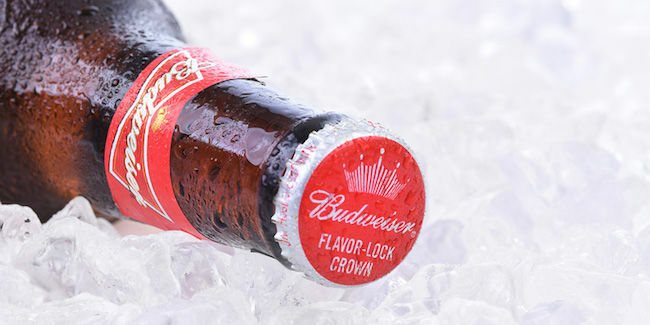 Have a great time and enjoy a bottle of cold Budweiser beer. Get big savings and you have the option to use the money that you have saved to buy more items. Buying cheap Budweiser beer online can be a bit challenging when you are on a tight budget. The deals here are updated and we made sure that you can use the voucher codes. Get big discounts at ASDA, Tesco, Approved Food, and other UK sellers. Here at Latest Deals, you will find the Budweiser products that you are looking for at very reasonable rates. 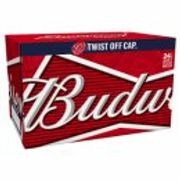 Cheapest deals on all Budweiser products! Beer is one of the oldest and widely consumed alcoholic drinks in the world, and the third most popular drink overall after water and tea. It is made by the fermentation of grain, just as wine is made by the fermentation of fruit. It is produced with malted cereal grains (wheat, barley, corn, etc. ), hops and water that is fermented by adding yeast. Alcohol levels of beer range from 2% to 15% alcohol by volume (ABV). When thinking of American beer it's impossible not to think of Budweiser. It's the best selling beers in the U.S. Budweiser is a medium bodied, crisp, flavourful American-style lager. Made and brewed with finest and best barley malt and a blend of premium hop varieties, an icon of core American value - optimism and celebration. Budweiser is brewed from hand selected barley malt, which was immediately brew using fresh, verdant rice-milled, polished, and graded rice. It’s water is filtered and tested it daily for purity by the company’s Brewmaster. And only the supplest, most aromatic hops are selected to create the distinctive taste of Budweiser. Reserve Copper Lager. A flavourful American Copper Lager brewed with two-row barley and aged on real Jim Beam Bourbon barrel staves for a toasted oak aroma, a deliciously nutty taste with caramel rye and vanilla notes, and a smooth finish. Freedom Reserve Red Lager. This red lager is brewed with toasted barley grains for a slightly sweet aroma with a touch of hops, a rich caramel malt taste, and a smooth finish with a hint of molasses. 1993 Repeal Reserve Amber Lager. A limited edition Amber Lager from the AB archives to celebrate the repeal of prohibition in 1933. Select - Select from Budweiser has the full beer flavor you love, but with the calories and refreshment of a light beer. It’s the light beer for people who love beer. Select 55 - Select 55 is golden lager made with caramel malts and a blend of imported and domestic hops. Select 55 is brewed to complement the full-flavor of Select, but with only 55 calories. So you can be good, and still have a good time. Chelada - Budweiser Chelada with Clamato is a savoury new spin on a classic. With the crisp smooth taste of an American Lager, the rich spicy flavor of clamato and a hint of lime, Chelada is perfect for almost any occasion. It pairs well with Latino dishes like ceviche, enchiladas, and tamales. Also, try the Picante flavuor for an extra kick! Contains nutrients. Beer contains 90% of water which consists of soluble fiber and trace amounts of calcium, iron, magnesium, phosphorus, potassium, sodium, zinc, copper, manganese, selenium, fluoride and silicon. It has a unique antioxidant profile, a majority of it comes from the malt and the remainder from the hops. May boost bone health. Beer contains dietary silicon, which is important for the growth and development of bone and connective tissues. A study made found out that moderate drinkers were 38% less likely to have osteoporosis than non-drinkers, and moderate drinkers had a 20% lower risk of hip fractures than non-drinkers. It has been suggested that beer's dietary silicon may be responsible for part of these bone-protecting effects. May improve cholesterol. A study was made and found out that moderate drinking of beer will associate a slower decrease in good cholesterol over time. But a study also made that heavy drinking eliminated this benefit. May reduce the risk of Type 2 diabetes. Moderate alcohol consumption with a 30% reduced the risk of type 2 diabetes compared to those who do not drink or heavy drinker. However, its still being studied. May enhance cognitive and psychological health. Some Parkinson's disease researchers suggest that light to moderate drinking of beer in middle to late life have less cognitive decline than to those who do not drink or those that are a heavy drinker. Drinking beer in moderation also has psychological benefits. Studies have found out that it can help reduce stress and tension and increase feelings of well-being. If you’re looking for cheap Budweiser deals online, you’ve come to the right place. 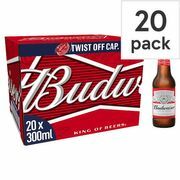 Here at Latest Deals, you’ll find the latest Budweiser deals on sale, Budweiser 20 pack and 24 pack, as well as special offers on Budweiser bottles in the UK. So whether you’re looking for the cheapest Budweiser beers or best price on Budweiser products from major supermarkets, you will find it here at everyday low prices. Our massive community of bargain hunters are always sharing verified deals and special offers they have found online. Take advantage of the price reductions and massive savings you can get from your favourite UK retailers. We also have a team of money-saving experts who regularly share essential shopping tips and tricks that you can use online or instore to get the best possible savings around. 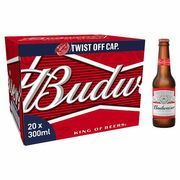 Most UK online retailers have sale events such as clearances, flash sales, Black Friday, and Boxing Day where you can save as much as 30% off on a wide selection of Budweiser products. You can also get additional money off when you use the latest Budweiser discount codes we have here. Plus, there are also voucher codes where you can get freebies and free shipping!